I knew this day would come, but I’ve dreaded it all the same. Why on earth did Reki Kawahara think that this was a good idea? I even put off watching these episodes for a week because I didn’t want to deal with what I saw. Well, there’s no point in delaying the inevitable. 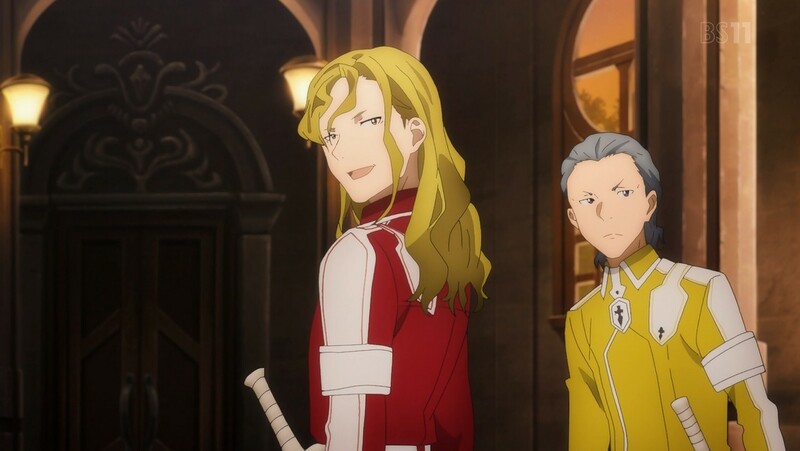 Here are the episodes of Sword Art Online: Alicization that caused controversy before Shield Hero was a thing. And unlike Shield Hero, these episodes were legitimately controversial. Time has passed since Kirito and Eugeo became elite swordsmen at the Sword Mastery Academy, and Eugeo’s skill continues to grow. After realizing that he doesn’t have that spark to his attacks that others have, Eugeo begins to train himself even further. Then these wastes of human flesh show: Humbert and Raios. They’re Nobles who wrecked Kirito’s flower bed last episode. They also represent the worst kind of upper class people: the kind that gets off bullying everyone beneath them, like Eugeo. That’s probably how they get the number one and two spots in the academy. In order to gauge how powerful he is and how strong they are, Eugeo duels Humbert. The brat’s power is formidable, and literally fueled by his arrogance, but Eugeo manages to fight him to a standstill. 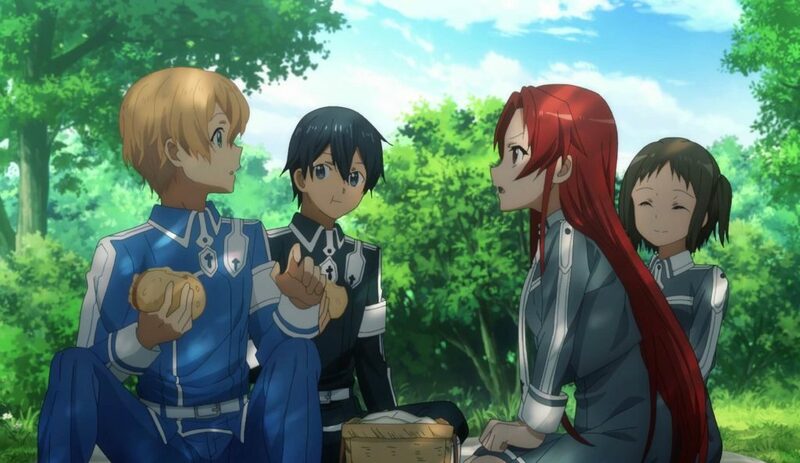 A few days pass, and Kirito and Eugeo are taking their valets, Tiese and Ronye, for a picnic. After a while, Tiese and Ronye bring up a big problem their friend, Frenica, is having. Humbert’s her mentor, and ever since their duel, he’s been forcing Frenica to do things that are borderline sexual harrassment. He’s been forcing her to massage him in the baths in her underwear. Just typing this makes my stomach churn. It all goes back to the Taboo Index and how flawed it is, and Kirito doesn’t buy it. Doing what one knows is right is more important than following some dumb rules. When the two confront Humbert and Raios, they admit it, but they can get away with it because of the Taboo Index. I can’t stand it. Watching people in power abuse it for their own sick desires makes my blood boil and my stomach churn. The worst part is that this isn’t limited to fiction: this happens in real life. That evening, Tiese confesses to Eugeo that, she graduates, she will be forced to marry someone of higher status, and she’s terrified that it will be someone like Raios and Humbert. If Eugeo were to rank high enough in the future Four Empire Unification Tournament, he’ll be granted a rank of nobility. I think you know where this is going. A few days later, Eugeo gets a knock on his door and meets Frenica. The poor girl reveals that Tiese and Ronye went to confront Humbert and Raios and never came back. Yep, the two have been kidnapped by the monsters, and as they punishment for their “disrespect” they’re going to violate them. When Eugeo tries to stop them, the cowards invoke the Taboo Index as justification. Remembering his inability to save Alice and what Kirito said in the last episode, Eugeo overcomes the Taboo Index through sheer willpower and slashes Humbert’s arm off. When Raios tries to kill Eugeo for attacking them, Kirito intervenes, and proceeds to slice Raios’ hands off. The living pile of crap then bleeds to death while his fluctlight tears itself over using Humbert’s life to save himself and violating the Taboo Index. As Kirito, Eugeo and their valets process what just happened, that creepy face that showed up when Alice broke the Index appears again. The boys know what this means. The next morning, an Integrity Knight shows up to take them to the Central Cathedral for punishment. The knight in question shocks Eugeo, though. She looks just like Alice. I don’t know what Reki Kawahara was thinking when he thought that this moment was a good idea, but it may not have been any good. I was already pushing it with what happened with Asuna back in the Fairy Dance Arc, but this was just as bad. That’s why I put off watching it until now. That said, the original Web Novel version was actually worse. What Humbert and Raios planned to do to Tiese and Ronye actually happened in the Web Novel. Which is just as bad! After watching this, I have to admit that it was as cringeworthy as I thought it would be. The worst part, though, is that part of the story wasn’t even included. In the Light Novel, Eugeo had this internal struggle over defying the Taboo Index. In here, we barely even see it.. I mentioned back when I started this that I loathed the Taboo Index with every fiber of my being. This moment is why. It’s a rule that literally keeps people from doing anything when they see something they know is wrong happen in front of them. I’m proud that Eugeo was able to do what he did. I would have done the exact same thing. As for the Integrity Knight who looks like Alice, I can assure you that its really her. 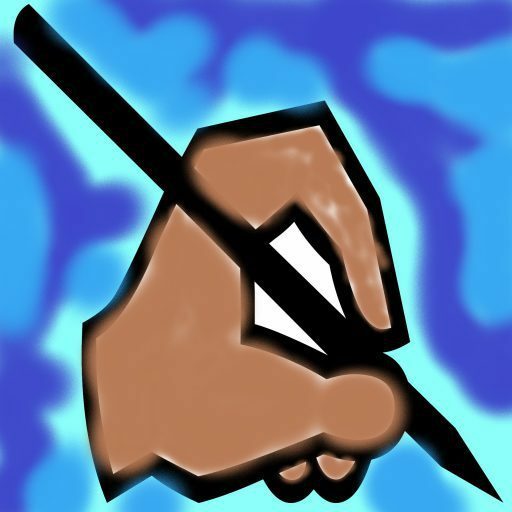 Read the wiki, remember? How she got to be like this is going to be revealed over the remaining episodes this season. Next week, we begin the second half of this season. I Give “Nobleman’s Responsibilities” and “Taboo Index” A 2/5.